Planting a church is not easy. There are no blueprints for doing it. 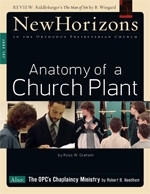 Because each local church is planted in its own location and consists of a unique group of people, the variables involved in establishing a new body of believers are endless. Church planting is not a science. It is a spiritual undertaking. It is God who establishes new churches. Those who work, lead, and help are only the tools he uses. The Committee on Chaplains and Military Personnel was established by the 64th General Assembly in 1997. The task of the ordained officers on that committee is to represent Orthodox Presbyterian chaplains and other OP interests on the Presbyterian and Reformed Joint Commission on Chaplains and Military Personnel (the Joint Commission). Previously, the General Assembly simply elected men to serve on that interdenominational commission for three-year terms, without any committee standing.